Origin and Habitat: Othonna armiana is endemic to the Richtersveld [Rooiberg] , north-east of Eksteenfontein, Northern Cape, Repubblic of South Africa. Altitude range: Around 900 metres above sea level. Habitat and Ecology: Kahams Mountain Desert. This species grows firmly wedged in rock crevices on upper southern slopes of a granite mountain, on acidic sandy gravel (pH 4,7). The climate is arid and the precipitation occurs mainly in winter and ranges from 100-150 mm per annum. The vegetation comprises numerous succulents such as: Crassula macowanii, Conophytum gratum, Crassula montana ssp. quadrangularis, and Herreanthus meyeri. Flowering time autumn (February-May). It is a localized habitat specialist, known from one location and potentially threatened by overgrazing and trampling. This species' preference for rocky crevices however may offer it some protection against the effects of grazing. 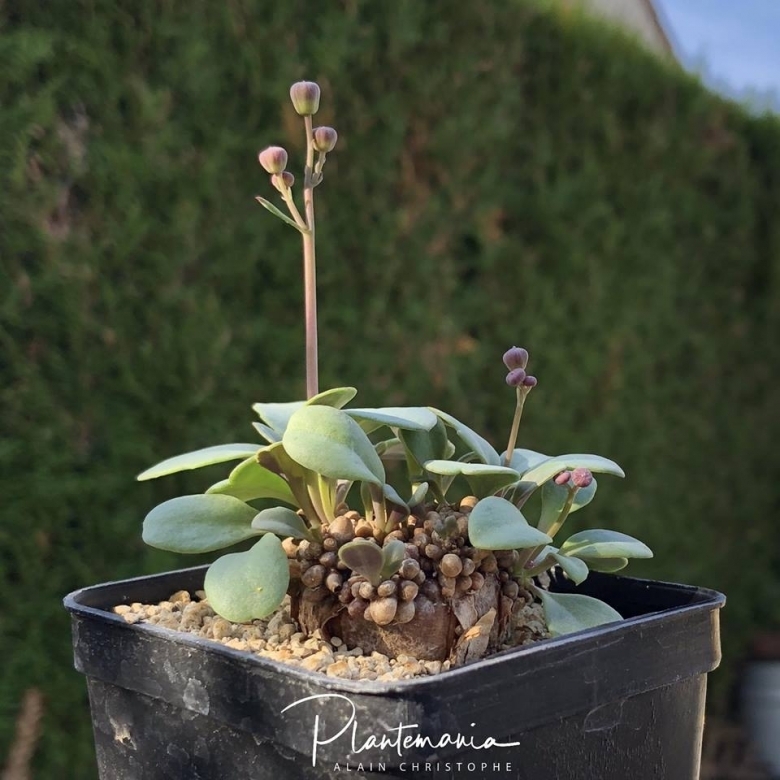 It is also popular in horticulture, and is potentially threatened by collectors removing plants from the wild for the succulent trade. Description: Othonna herrei ssp. armiana is a dwarf caudiciform, cremnophyte shrublet (living on rocks), similar to Othonna herrei. It grows as a solitary main stem, usually exhibiting a shorter squat or compact caudex, mainly underground with a flattened crown and short knobbly branches covered in phyllopodia (swollen tubercles made up of the expanded and fused bases of leaves). The leaves are obovate to orbicular, serrate to entire. Othonna herrei is similar (non-cremnophilous). However, it is a small, erect shrublet with longer stems and without the basal swollen caudex. Derivation of specific name: The epithet is derived from the initials and part of the surname of Mr Anthony R. Mitchell who first discovered this species. Caudex: Subterraneous, 30-70 mm across, flattened above, tapering below, with brown, longitudinally fissured bark. The bole is covered by short dense knobby branches, 3-20 mm long, 3-10 mm in diameter with persistent cartilaginous oblong phyllopodia 2-5 mm long, 2-3 mm in diameter, brownish-purple and truncate at the apex. The young branches are slightly woolly, becoming glabrous with age. Leaves: Obovate to orbicular, succulent, slightly woolly at the base, 5-22 mm longm 5-18 mm wide. Margins serrated to entire. Petiole 2-4 mm long. Inflorescences: One or two, terminal, on 60-90 mm long, erect peduncles, glabrous with two to five radiate capitula (heads) 4-5 mm in diameter. Involucre bell-shaped with 8 o involucral bracts 5-7 mm long. Ray florets 8, yellow. Disc florets numerous, bisexual, yellow. Fruit: Achene 3 mm long when ripe, dark brown, 10-ribbed. Pappus consisting of numerous persistent 4 mm long bristles. 14) Hilton-Taylor, C. 1996. "Red data list of southern African plants". Strelitzia 4. South African National Botanical Institute, Pretoria. 15) Raimondo, D., von Staden, L., Foden, W., Victor, J.E., Helme, N.A., Turner, R.C., Kamundi, D.A. and Manyama, P.A. 2009. “Red List of South African Plants”. Strelitzia 25. South African National Biodiversity Institute, Pretoria. 16) Snijman, D.A. 2013. “Plants of the Greater Cape Floristic Region 2: The extra Cape flora”. Strelitzia 30. South African National Biodiversity Institute, Pretoria. 17) Van Jaarsveld, E.J. 1986. “Othonna armiana (Asteraceae): a new species from the North-western Cape”. South African Journal of Botany 52(6):569-571. 18) Victor, J.E. 2002. South Africa. In: J.S. Golding (ed), “Southern African plant Red Data Lists”. Southern African Botanical Diversity Network Report 14 (pp. 93-120), SABONET, Pretoria. Cultivation and Propagation: This species is propagated in autumn by seeds that germinate within 4-10 days.